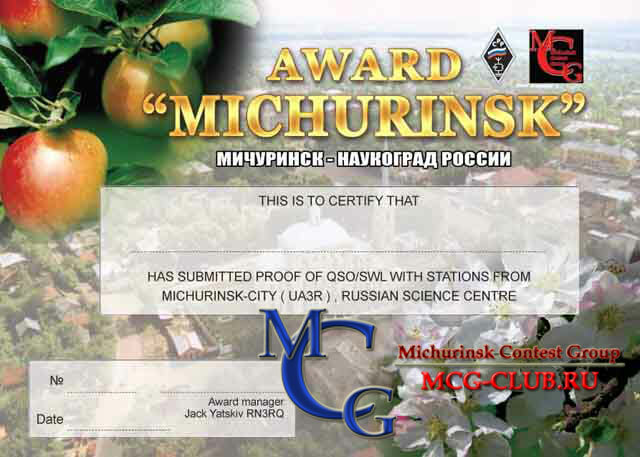 EU stn’s - 30 points , DX’s - 15 points after Oct.1st 1990 with “Michurinsk Contest Group” and ARS from Michurinsk City – Russian science centre. Special “MCG” call’s - 3 pts, ”MCG” members - 2 or 1 pts. Fee : free of charge (please 1 IRC for post expenses).